b) The Doer (of auspicious happenings). SrI BhaTTar derives the meaning from "vidadhAtiiti vedhAh" - He is the Giver or Provider of unlimited and varied objectsof splendor. SrI kRshNa datta bhAradvAj gives the derivation "vidadhAtikAmAn svajanAnAm iti vedhAh". He also gives the reference to kaThopanishad- "eko bahUnAm vidadhAti kAmAn" (2.2.13). SrI P. B. aNNa'ngarAcArya svAmi gives thesecond interpretation - "anbargaLukku ma'ngalamAna vibhava'ngaLiac ceibavar". SrI Sa'nkara bhAshyam is vidadhAti sRjati itividhAtA vedhAh - The Creator. In amarakoSa we have srashTA prajApatir vedhAvidhAtA viSvasRT vidhih (1.17), and the explanation vidadhAti karoti iti vedhAh,offered by li'ngAyasUrin. a) He who has the marks of sovereigntywhichare His own. b) He who is both the Instrumental Cause and the Material Cause of the Universe. c) He who has beautiful, well-proportioned limbs. d) He who, in the form of the Universe, moves by Himself. The term a'nga here refers to the celestialmarks of sovereignty such as the chatra (umbrella), cAmara and other thingswhich are His own and unique (sva a'ngah). He is the Supreme King of all theworlds, and has the unique marks associated with this. SrI kRshNadatta bhAradvAjgives the following explanation: "svanyante Sabdyante sUktibhiriti svAni;tAdRSAni a'ngAni yasya iti svA'ngah". SrI Sa'nkara bhAshyam is "svayamevakAryasya karaNe a'ngam sahakaroti iti svA'ngah" - He is Himself theinstrument in accomplishing His works. The idea communicated is that bhagavAn isthe Material Cause as well as the Instrumental Cause of this Universe (SrIcinmayAnanda). SrI cinmayAnanda also indicates that the nAma can be interpretedto mean that bhagavAn has beautiful, well-proportioned a'nga-s or limbs. SrIsatyadevo vAsishTha uses the meaning a'ng - to go (agi - gatyarthaka dhAtu), andgives the interpretation that bhagavan has His movement by Himself, unlike allthe other life forms which move only because He is present in them as theantaryAmi. When the self leaves the body, the body loses the ability to move.Unlike these, e.g., in the form of the Sun, bhagavAn moves by Himself withoutthe need for any other external source. The dharma cakram writer gives the meaningthat He is One who helps Himself. He observes that meditation on this nAma ofmahAvishNu should reveal to us that when we worship Him, there is no need forany external help for us from anyone or anything in this world, since all thethings we need will be met from within ourselves. It is only when we go aftermaterial pursuit that we need the support of others. BhagavAn is in the ultimatestate where He needs nothing from anyone or anything. a) He who is unconquered, and unconquerable. b) He who is the Chief of the Unconquerable place called ajita or SrIvaikunTha. c) He who took the amSAvatara in the 6th manvantara as ajitah to help inchurning the Milk Ocean. d) He who is unconquered in His vow to protect those who have surrendered toHim. (SrI BhaTTar): ajitA, aparAjitA, etc. are alsonames for paramapadam, and He is the Chief of SrIvaikunTham, and so also He iscalled ajitah. He and His abode SrI vaikunTham and everything therein arecomposed of celestial matter called Suddha sattva, which is not under the swayof birth and death. He is thus unconquered by the sway of birth, aging, decay,and death which are characteristic of those that pertain to the world of prakRti.SrI v.v. rAmAnujan gives reference to SrI rAmAyaNam yuddha kANDam wherebhagavAn's nAma ajita occurs (120.16 -ajitah khaDgadhRg vishNuh kRshNaScaivabRhad balah). Here ajitah is interpreted by SrI P. S. kRshNasvAmi iye'ngAr asreferring bhagavAn being undefeated in His ASrita samrakshNam or His vow toprotect those who have surrendered to Him even once). (SrI Sa'nkara): na jita iti ajitah - One whohas never been conquered, and can never be conquered, is ajitah. SrI kRshNadatta bhAradvAj gives the interpretation - na jitah kenApi tribhuvane itiajaitah - One who has never been conquered by anyone ever in all the threeworlds. He has never been conquered by anyone in any of His incarnations, and soalso He is ajitah. He is satya svarUpi and dharma svarupi, and soalso He is unconquered and unconquerable (dharma cakram) - satyameva jayate. Thedharma cakram author gives innumerable examples to illustrate that satya anddharma are unconquerable, including those involving prahlAda, hariScandra, thepANDavas, etc. The lesson to take from meditating on this nAma is the greatnessof dharma and satya, and the life led conforming to these values. ajito nAma bhgavAn amSena jagatah patih || (SrImad bhAgavatam 8.5.9). SrI satyadevo vAsishTha points out that thereis a question of one being conquered by another only when they can be comparedto each other. In the case of mahAvishNu, there is no one else to compare toHim, and so there is no question of His being conquered by any other, and so Heis ajitah or unconquerable and unconquered. a) One who is always in a state of Bliss (withHis sport of creation etc.). c) He who irresistibly attracts His devotees to Him through His infinite kalyANaguNa-s.
d) He who cultivates the Earth like a plough and makes it suitable for lifeforms to form and nourish. e) He who appeared as veda vyAsa or kRshNa dvaipAyana. f) He who cultivates the minds of devotees by providing the veda-s in Hisincarnation as kRshNa dvaipAyana. g) The Dark, Mysterious, and Unknowable except by deep devotion. This nAma occurred earlier as nAma 58. Pleaserefer to the detailed interpretation provided there as well. The first fourinterpretations were covered there. Some additional details are provided here.In support of interpretation (a), SrI v.v. rAmAnujan observes that unlike inrAma incarnation where bhagavAn went through enormous difficulties - nATTilpiRandu paDAdana paTTu - nammAzhvAr tiruvAimozhi 7.5.2, in kRshNa incarnation itwas "inbuRum iv-viLaiyATTuDaiyAnaip peRRu (tiruvAimozhi 3.10.7)","kanRinai vAlOlai kaTTi (periAzhvAr tirumozhi 2.4.8)", etc. Anotheranubhavam of SrI v.v. rAmAnujan is that bhagavAn is laughing at us mockingly,seeing that we are not putting to good use the hands and legs and all theindriya-s He gave us to help us attain Him, but instead we are misusing theseand getting into the cycle of birth and rebirth. This is a slight variation of the Sloka alsoquoted from mahAbhArata under the explanation given under nAma 58. The two Sloka-sare too similar to each other to suggest that these are variants of the samereference. I do not have the original version of mahAbhArata to check theauthenticity of the references. In support of interpretation (b), SrI v.v.rAmAnujan gives references to the following: kaNNan enum karum daivam (nAcciyArtirumozhi 3.1), kariyAn oru kALai (tirumozhi 3.7. ), etc. SrI kRshNa dattabhAradvAj gives the following explanation along the lines of interpretation ©:karshati bhagavAn AtmAnam prati vayovarNa rUpaa lAvaNya madhurI rasotkarsheNaiti kRshNah, or kRshate AtmAnam prati bhaktAn sa-soundaryeNa iti kRshNah, basedon (kRsha vilekhanam AkarshNam ca). SrI satyadevo vAsishTha and others alsosupport this interpretation along with the other two. SrI Sa'nkara interprets this instance of thenAma of kRshNah as referring to veda vyAsa (e), who is none other than anincarnation of bhagavaAn according to SrI vishNupurANa - kRshNadvaipAyanamvyAsam viddhi nArAyaNam prabhum | ko hyanayh puNDarIkAkshAn mahAbhAratakRtbhavet (VP 3.4.5). The dharma cakram writer uses the concept ofbhagavAn being like a plough (the basis of interpretation d), combines this withSrI Sa'nkara's interpretation (e), and offers a new interpretation (f). Hisanubhavam is that in the form of veda vyAsa, bhagavAn cultivates the minds ofpeople by providing to us the veda-s, and so vyAsa, who is none other thannArAyaNa, is referred to by the nAma kRshNa here. SrI cinmayAnanda uses the meaning"dark" for the word kRshNa, and suggests that this nAma of bhagavAnsignifies the "unknown factor" that expresses through us - whosemanifestations are all our physical, mental, and intellectual capabilities.Except by deep and sincere devotion, He cannot be comprehended, and so He iskRshNah - Dark and Mysterious. a) He Who assumes firm, concrete vyUha formsfor the benefit of His devotees. b) He Who is firm and determined in His thoughts, words and deeds. c) He Who is firmly established and cannot benegated as the Supreme Deity bycounter-arguments. d) He Who is huge and strong. dRDha literally means solid, firm, strong,massive, etc. The root word from which the nAma dRDhah is formed is dRh -vRddhau - to be fixed or firm, to grow. SrI v.n. vedAnta deSikan gives theinterpretation in English as: Para vAsudeva takes the vyUha forms which are firmand concrete and are not merely of a nebulous, imaginative level. In otherwords, the term dRDhah here refers to forms that can be more easily comprehendedand meditated upon. SrI v.v. rAmAnujan gives reference to the nRsimhaincarnation - tiNNiyadOr ari uru, where ari means lion. b) SrI rAdhAkRshNa SAstri interprets the nAmaas referring to bhagavAn being firm in His actions - one meaning for acyutahwhich we will encounter later in this write-up. SrI cinmayAnanda observes thateven though bhagavAn is firm in His Infinite Justice, this Justice becomes a-dRDhahwhen a great sinner surrenders to Him, and bhagavAn immediately reaches out tohelp the sinner. c) SrI PBA gives the interpretation thatbhagavAn s dRDhah because He if firmly established as the Supreme Deity by vedicpramANa-s, and no amount of false arguments by the "bAhya ku-dRshTi-s"can negate that. d) dRDhah also means huge, mighty, strong, etc. - dRDhau sthUlobalavAn vA. Since bhagavAn assumes huge and strong forms when He takes Hisincarnations to destroy His enemies, this nAma can be interpreted as a referenceto this guNa of His. SrI satyadevo vAsishTha gives the explanation dRDahu sthUlobalavAn vA. He also gives another view - everything that bhagavAn createsreflects His guNa of firmness. The Oceans have always been firm in keeping themassive amount of water in their bounds without exception, and the skeleton thatholds the body together is firm from birth to death and never collapses from itsshape, and the earth holds all its subjects and contents firmly. BhagavAn who isgiving all of these their firmness, is thus also called dRDhah. He Who draws others near Him. SrI BhaTTar's vyAkhyAnam is "samsAre cit-acitohAtmani samam karshaNAt samam karsham nayati" - In this world, He drawstowards Himself both the cit and acit in the same way and unites them - Hispower of attraction is uniform, and so He is called samkarshaNa. SrI Sankaraspecifically refers to this attraction as referring to the time of cosmicdissolution, when bhagavAn draws everything towards Himself. SrI kRshNadatta bhAradvAj gives theinterpretation - samyak karshati iti sankarshaNah; SrI bhagavAn svajanAn AtmAnamprati svakIyaih vAtsalya mAdhuryAdi guNaih karshati - He who draws His devoteestowards Him through His infinite guNa-s such as vAtsalyam, His exquisite beauty,etc. SrI Sankara combines this nAma with the nextone, acyutah, and interprets sankarshNocyutah as one nAma, meaning that bhagavAndraws everything at the time of dissolution towards Himself (samkarshNah), whileHimself not slipping from His Real Nature (acyutah). SrI rAdhAkRshNa Sastrigives yet another anubhavam for the sequence dRDhah, sankarshNah, and acyutah:dRDhah - He is one who is firm in His Nature, sankarshNah - He who draws thosewho are caught in the ocean of samsAra towards Him with firm determination andMercy, and acyutah - He Who is firm and does not slip while drawing the entiregroup of these cetana-s towards Him. The dharma cakram writer gives a simpleanalogy to illustrate the above. To drag someone who has fallen into a forcefulriver to safety, the savior should be strong enough not to be drawn by the riverhimself, but also should have the strength to drag the other individual againstthe force of the river. BhagavAn is the acyutah who has the firmness, resolve,and the power to save the samsAri-s from the ocean current of samsAra. a) One who never slips from His glory. b) One who never lets His devotees slip. c) One who undergoes no modifications such as birth, growth, decay, disease,etc. The source of this reference has not beenprovided in Prof. SrInivAsa rAghavan's text. The meaning is: "Whereasbrahma, varuNa, and others are subject to birth and death and fall down fromtheir position, Thou dost not fall down like that. So Thou art called acyuta". Sri rAdhAkrshNa SAstri points out that He alsodoes not slip from His position by being influenced by kAma etc. unlike Brahma,Indra etc. In mahAbhArata we have "yasmAt na cyuta pUrvo'ham acyutastenakarmaNA" - SAnti parva 12.330.16. Sri Sankara interprets the above asmeaning "svarUpasAmarthyAt na cyuto na cyavate na cyavishyata iti acyutah"- He has not lapsed, is not lapsing, and will not lapse from His own glory;hence the name acyuta. The dharma cakram writer points to the passagein muNDakopanishad which describes the two birds sitting in different branchesof the tree, one tasting the fruit and the other just watching the bird that istasting the fruit (of karma). This has been described in a previous write-up.BhagavAn is the acyuta, from His superior position, watching the jIvAtmA whichis tasting the fruits of karma in this case. b) Sri Bhattar also gives the alternatevyAkhyAna: "I have never abandoned (my bhaktas). Because of this act ofmine, I am known as acyuta". His words are "tebyah prapannebhyah naapagatah acyutah - He is never away from those who have sought refuge inHim". Sri tirukkaLLam nrsimharAghavAchAryar in his bhagavadgItA bhAshya hasgiven the explanation na cyAvayati iti acyutah - One who does not let Hisdevotees slip. arjuna calls Lord kRshNa as acyuta since He has taken it uponHimself to be his charioteer and will ensure that arjuna will not slip. SrI v.v. rAmAnujan adds the followingreference from rAmAyaNa in support of the interpretation "He who does notlet His devotee slip" - na cyAvayati - "mitra-bhAvena samprAptam natyajeyam kathancana dosho yadyapi tasya syAt " - "No matter what flawsa person has, if he has come to Me seeking My friendship, there is no way that Iwill abandon him under any circumstance". SrI rAmAnujan also gives thereference to divya prabandham - "kArtigaiyAnum kari-mugattAnum kanalummukkaN-mUrtiyum mODiyum veppum mudugiTTu" - the reference here is to thestory of bANAsura who was abandoned by the other devatA-s when he approachedthem for protection. Not so with bhagavAn - na me bhaktah praNaSyati - "Mydevotee will never perish" - gItA. c) cyutam means modification. The upanishadsays of BhagavAn - "SASvatam Sivam acyutam" - Eternal, Auspicious, andChangeless" - taittirIya AraNyakam - 10.11). Sri rAdhAkrshNa SAstri pointsout that BhagavAn is acyuta because He does not slip from stage to stage in thesequence of events such as birth, living, growth, change in appearance, decay,and finally disappearance from the body. The word is derived from the root vr~nj varaNeto envelop. SrI BhaTTar gives the example of "yena AvRtam kham ca divammahIm ca - He by Whom are covered the Ether, the svarga, and the Earth" -taittirIya upanishad 1.1. In other words, He surrounds all the three worlds (SrIrAdhAkRshNa SAstri). varuNa is also the term used for the eveningsun. Like the sun who withdrawing his scorching rays unto himself in theevening, the Lord withdraws all the pluralistic world unto Himself. The EternalReality , functioning through the sun as the sun's energy and light, isdescribed in the upanishads as the "Golden One", and hence theappropriateness of using this term varuNa for nArAyaNa (e.g., the designationsUrya nArAyaNa (SrI cinmayAnanda). The dharma cakram writer lists the followinganubhava-s related to this mantram (note how the learned people view the nAma-sof the Lord that occur in sahasranAmam): varuNa is the the Lord of the waters;He is also the setting sun in the evening; He is also the Lord of the westerndirection. Just as darkness envelops us when the sun sets, those who do not havethe thought of bhagavAn fall into darkness. As long as they have the thought ofbhagavAn in their mind, there is the brightness of j~nAna guiding them. a) He Who is with those who have sought Him astheir Lord or svAmi. b) The Son of varuNa. a) SrI BhaTTar interprets the nAma as: tamsvAmitvena vRNute iti varuNah; tatra bhavo vAruNah - varuNa refers to one whoseeks Him as his master; bhagavAn is called vAruNa since He is always with thisseeker. The nirukti author gives the following interpretation of SrI BhaTTar'svyAkhyAnam - svAmitvena vRNAneshu sthito vAruNa Iritah. SrI v.v. rAmAnujan givesreferences to the following from divya prabandham which convey the thoughtconsistent with this interpretation - "vandAi en manam pugundAi mannininRAi" - tirumozhi 1.10.9; "unnaik koNDu ennuL vaittEn" -periAzhvAr tirumozhi 5.4.5). b) SrI Sa'nkara bhAshyam is "varuNasyaApatyam vasiThah agastyo vA vAruNah - vAruNa refers to the son of varuNa, viz.vasishTha or agastya, who are both incarnations of bhagavAn c) SrI kRshNa dattabharadvAj gives the interpretation c above: vArayati nivArayati vipadamsvajanAnAm iti vAruNah. a) He Who provides shade like a tree (i.e., Heis the Resort) for the wise. b) He Who is firm like a tree. a) vRksha is derived from the root vRj varaNeto seek or resort to (SrI BhaTTar). SrI BhaTTar points out that like a shadytree, bhagavAn is possessed of all things required by those who resort to Him,and He gives shade to even those who insult Him, just as a tree gives shade toeven those who cut it. SrI P. B. aNNa'ngarAcArya svAmi points out that bhagavAnis waiting for the devotee to come to Him with His protection always availableto them. So He is called vRksha. SrI BhaTTar gives the following references insupport of his interpretation - nivAsa vRkshah sAdhUnAm ApannAnAm parA gatih -He is the one Resort for the good and the supreme refuge in distress (rAmA.kishkindA. 15.19); vRksha iva stabdho divi tishThatyekah - Like an unmoving andfirm tree He stands in the Heavens - mahA nArA. u. 10.4). SrI v.v. rAmAnujanobserves that there are several who get saved by this "vAsudeva taruc chAyA"or the shade from the tree by name vAsudeva. He also refers us the prabandham -"tan oppAr illppan tandanan tana tAL nizhalE" (tiruvAimozhi 6.3.9). (Rg. 1.164.20),paramAtmA (yasmin vRkshe madhvadah suparNAh niviSante stuvate cAdhi viSve (Rg.1.164.22) etc. Since bhagavAn appears in all these forms of vRksha, His nAma isvRksha. SrI vAsishTha also gives another anubhavam forthis nAma. vRksha could also mean tearing apart, separating - based on vraSc -chedane - to cut, to tear. The jIvAtmA separates the bodies, bhagavAn separatesthe different jIva-s in His creation, He keeps the starts and the planetsseparated, the sun tears apart the darkness, the tree separates out the fruitsfrom the leaves and the branches, etc. So these are all vRksha-s viz. those thatseparate out different things. BhagavAn has thus manifested Himself in HisvRksha aspect and expanded this world in its variety. SrI vAsishTha proceeds tocomment that one who understands this secret behind bhagavAn who is a vRksha,will succeed in tearing apart from the tree of desire and reach bhagavAn thevRksha from all aspects and dimensions. The dharma cakram writer points out that thelesson to take from this nAma is not to just seek the shade alone from this Treeas duryodhana did, but to really benefit from the fruit from this Tree as arjunadid. If one only wants the temporary shade, then the shade of the tree keepsshifting with time relative to the sun's position, and so seeking the shade inthe form of temporary benefits is not what will lead to permanent Godrealization. Instead of asking for the kRshNa's army and rejecting kRshNa asduryodhana did, one should seek Him as arjuna did, which will then take care ofall the other needs. a)He Who has nourishing eyes. b) He Who has beautiful lotus-like eyes. c) He Who pervades all space. d) He Who has the Sun and the Moon as His eyes. e) He Who shines as the light of consciousness when meditated upon in the lotusof the heart. a) SRI BhaTTar derives the interpretationbased on the root push - pushTau - to nourish. svAmi deSikan describes His eyesin SrI bhagavd dhyAna sopAnam as "svAgata udAra netram" - Lordra'nganAtha's Merciful and welcoming eyes always look at the devotee who isapproaching Him. The beauty of His eyes are again described in SrI daSAvatArastotram as resembling a forest of beautiful lotus flowers - aravinda gahanAnitanvan iva datta kshaNair vIkshaNaih (Slokam 2). b) pushkara refers to a lotus, and aksha meanseyes. So pushkarAkashah refers to One with lotus-like eyes. SrI kRshNadattabhAradvAj gives the SrI rAmAnuja-fame quote "tasya yathA kapyAsampuNDarIkam eva akshiNi" from chAndogyopanishad 1.6.7.
c) pushkara also means Universal Space, andakshu means pervading, and SrI cinmayAnanda follows SrI Sa'nkara in interpretingthe nAma as "He Who pervades all space". d) In addition to c), SrI satyadevo vAsishThauses a variant of the above, and also gives the interpretation that bhagavAn hasthe two eyes in space, viz. the sun and the moon (yasya sUryaS cakshuScandramASca punarNavah - atharva. 10.7.33). e) When pushkara is interpreted as theheart-lotus, pushkarAksha can be interpreted as referring to One who illuminesthe heart-lotus when meditated upon (SrI Sa'nkara). The dharma cakram writer,whose name is not given but who is a sanyAsin of the SrI rAmakRshNa tapovanamOrder, observes that for a beginner who wants to practise meditation,concentrating on the heart-lotus is easier than concentrating on the spacebetween the two eye-brows etc. (The later can cause a head-ache for a novice whois not used to meditation!). b) He Who has a great (highly capable) mind. a) SrI BhaTTar: Since bhagavAn has a generous,deep, and broad mind towards His devotees, He is called mahA-manAh. SrI v.v.rAmAnujan gives reference to peria tiru antAdi 53 - un aDiyArkku en Seyvan enrEirutti nI (note the emphasis in enrE isntead of just enru! 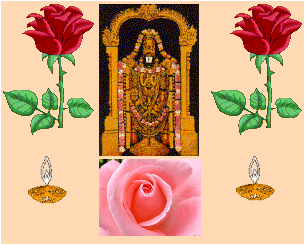 ), and also totiruvAimozhi 9.4.10 - aDiyAn ivan enRu enakku Ar aRuL Seyyum neDiyAn. Theinstance of His feeling forever that He had not done enough to help draupadiafter she cried out for Him and He saved her from being defamed by duryodhanaalso comes to mind. His Nature is that He forgives even the worst of sinnerswhen they surrender to Him - such is His broad-mindedness. b) SrI Sa'nkara: By His mind alone, Heperforms the creation, preservation, and withdrawal of the world - such is thecapability of His mind. The karmendriya-s are not involved in this process. SrISa'nkara quotes the vishNu purANa in support - manasaiva jagat-sRshTim samhAramca karoti yah (5.22.15). c) SrI satyadevo vAsishTha: BhagavAn is mahAmanAh because He has knowledge which supercedes anyone else's knowledge in thisUniverse, and also as antaryAmI in everything that exists, He knows everythingthere is to know. All great ones pray to Him for knowledge - yAm medhAmdevagaNAh pitarSca upAsate | tayA mAm adya medhayA agne medhAvinam kuru || (yajur.32.14). The dharma cakram writer observes that in the sequence"body, indriya-s, and mind", body is the sthUla or bigger one, andmind is the subtle one or sUkshma. The subtler one is the more capable in thissequence, and without the mind the indriya-s don't function, and without theindriya-s the body does not function.